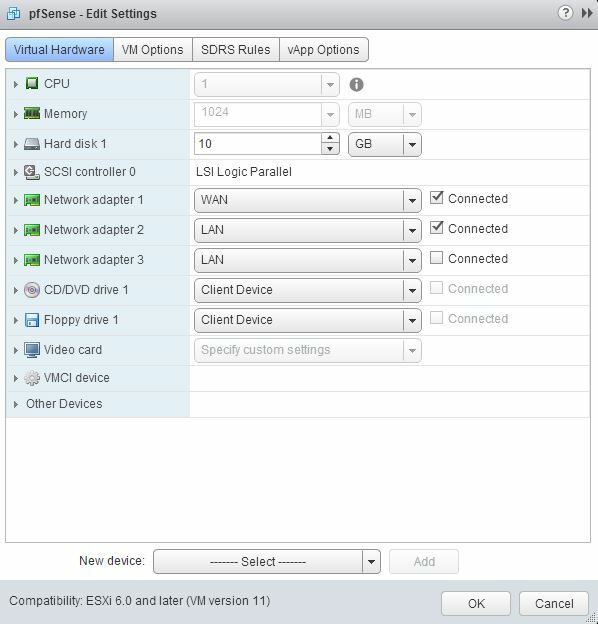 I struggled to title this blog post because the purpose of this implementation for me was to modify my existing vSphere environment so that I could host VMs in their own segregated network. Really, you don’t need that requirement for this to be useful – this post also documents how to segment your network with VLANs while using a virtual pfSense firewall. I found it confusing enough that I thought it’d make for a good blog post regarding a VM of pfSense and VLANs. I wanted to be able to spin up a small Linux VM and let a friend remote into it to test an application but I didn’t want him being able to run free on my network. There’s many ways to accomplish this, so don’t take my instructions below as the sole method. Because I run a virtual pfSense firewall, the networking portion of this is a little more confusing than if the firewall were physical. Originally, I had this concept working by simply creating an additional vSwitch on my ESXi host. I then added a NIC to my pfSense VM and connected it to a port group on the newly created vSwitch. After creating VMs and putting them in this new port group, I was able to control access to and from this new interface in pfSense. However, if you read the Configuration Maximums documentation for vSphere 6.0 you’ll find that there is a 10 NIC limit per VM so this method will not scale well at all. So, while this would work, I could potentially run into issues with total NIC counts on the pfSense VM and, even worse, each time I added a NIC I had to reboot the firewall because FreeBSD does not support hot-add of NICs yet. I don’t suspect needing that many NICs/networks on my firewall, but it’s not best-practice if we’re working toward real-world concepts. As you can see, the diagram above is a bit busier. That’s mainly because I decided to include more detail in order to better explain the solution. Starting at the top, you’ll find my internet connection (Verizon Fios) lands on my Dell PowerConnect 5448. I have the Fios ONT box land on the switch in a small 3-port VLAN because I want the ability to fail the firewall over to another host if I have to – having the switch involved means I don’t have to have the connection from the ONT plugged directly into a single host. We need to create a VLAN and place a few ports on it because we don’t want the DHCP from Verizon Fios being available to any old device on the switch. 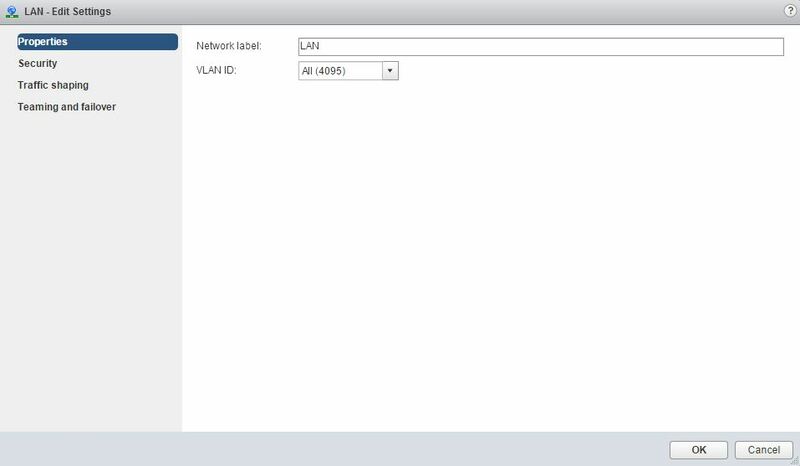 Note that the WAN VLAN does not leave the Dell PowerConnect switch. You’ll see above that vmnic6 on my ESXi host connected to the switch as part of the small VLAN. The PowerConnect 5448 also has all of the VLANs created on it that I am planning to use. To start, I’ve created VLAN2, VLAN51, and VLAN200. It’s always a good idea to label your ports with descriptions so that you can configure them later. 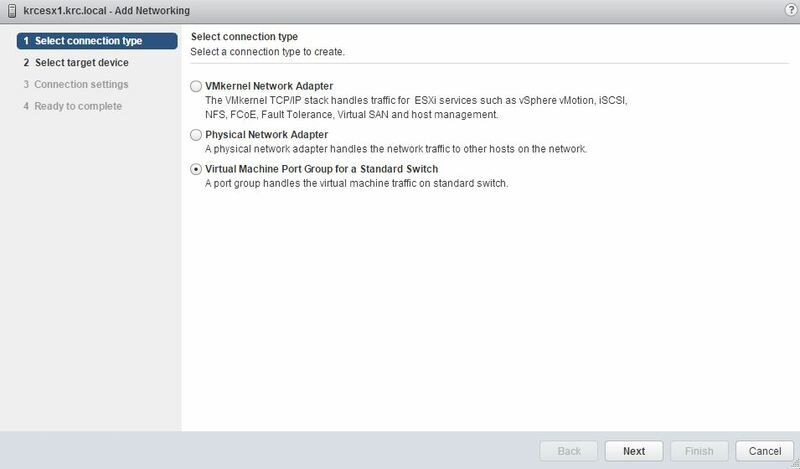 With Cisco switches you can enable CDP and then identify which vmnic goes to which port of your switch. With Dell you can enable LLDP but I don’t currently have it enabled. In order to identify the ports you can use the show bridge address-table command on a PowerConnect switch to show the MAC address table and correlate the MACs of your ESXi host to the ports on your switch. If you have two NICs in an active/active configuration you may need to set one NIC to “standby” or “unused” for the remaining MAC to show up. The MAC table will only show information once traffic is initiated and the switch learns the MAC. Remember earlier when we focused on how a physical setup would trunk the VLANs all the way down to the VMs? Well, we still need to do that – except we can’t make a “trunk” port going into a vSwitch in the conventional sense. Instead, we can tag the port group that a VM is a member of for “All (4095)” VLANs – in doing this, the pfSense will receive any packets upstream that are tagged for any VLAN. This step is crucial as it basically “trunks” all VLANs through to the pfSense VM “LAN” NIC. Something worth noting is that “All (4095)” VLANs include the default VLAN1/untagged traffic. I have a bunch of VMs already on the “LAN” portgroup when it did not have a VLAN ID set. Setting it the “All (4095)” did not disturb the VMs already there. Above you’ll see that I created a “Conway DR” and “HPS Network” port group each tagged for VLAN 51 and 200, respectively. That’s it! 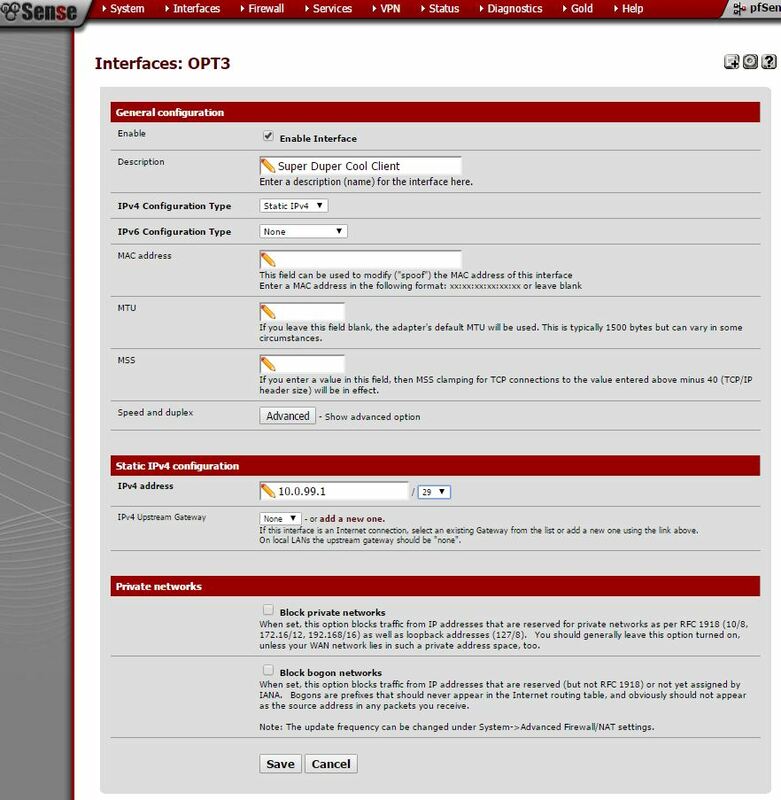 Now, you have a port group associated with VLAN 999, a sub-interface in pfSense associated with VLAN 999, and when you hover over Firewall and then select Rules you will see the interface as a tab and you can create rules! You can also setup a DHCP server for this new interface if you choose. From here, you’d simply create a new VM and when you go to configure the NIC you will see your newly created port group in the drop down – simply select the port group you want, IP the VM (or let DHCP do it), and you’re set. Remember that the gateway for the VM will be the sub-interface IP we set in the screenshot above (10.0.99.1 in the example). 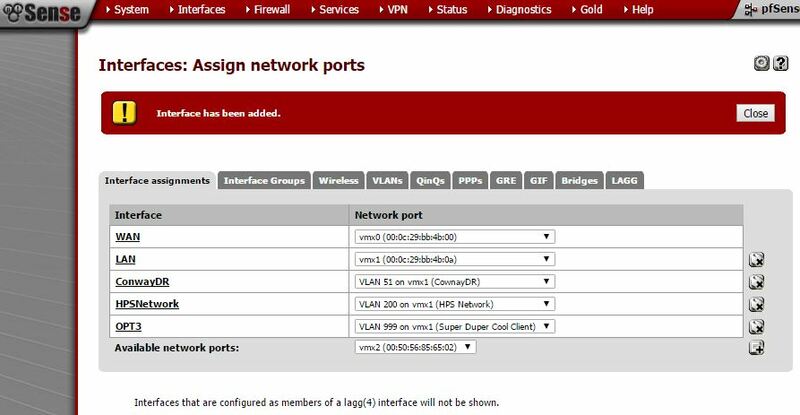 Going forward, you could create a new port group/sub-interface for each “client” or network you want to isolate (remembering to trunk the VLAN from the switch all the way into the pfSense VM) and create rules as needed. Or, you could create a “client network” and simply drop whatever VMs are not part of your personal/management network into that port group and IP them accordingly. 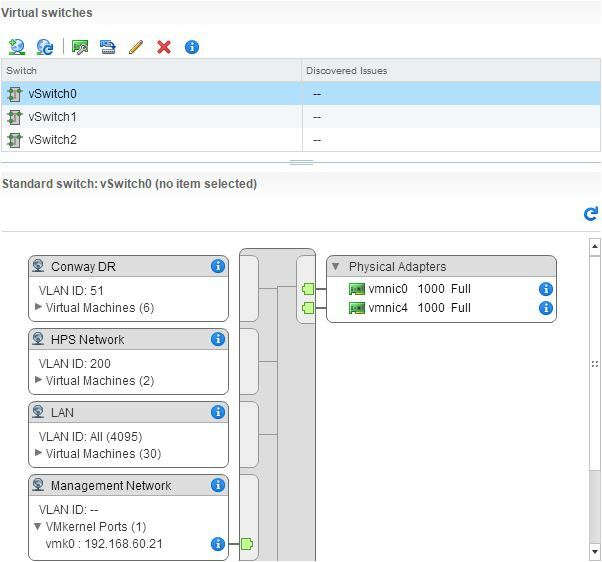 There’s potential for the VMs to see each other this way, but the access rules can be configured so that they won’t be able to see anything outside of their own VLAN. If you were a large cloud host you could create these many “client networks” with 24-bit masks so as to keep broadcast domains small, for example. The whole point of doing it this way is not only to make it easier to manage from a vSphere perspective, but so to also not run up against the NIC limitation at the VM level. And, as mentioned before, adding/removing NICs from a FreeBSD VM will require the VM be rebooted for the changes to take effect. The “sub-interface” method is much more production-friendly and most similarly matches the first diagram in this blog entry dealing with conventional physical network equipment. I hope you found this entry useful – let me know if anything needs clarification or is incorrect! One last thing I wanted to add – I did this configuration 100% remote. Everything from identifying the ports on the switch to making them trunks, to adding sub-interfaces is all non-invasive (if you do it right). If you think ahead, you can move everything around to a properly secured/zoned VLAN setup without disturbing any network connectivity already in place! Thank you so much for sharing your wealth of knowledge on how to configure a pFSENSE VM on vSphere. 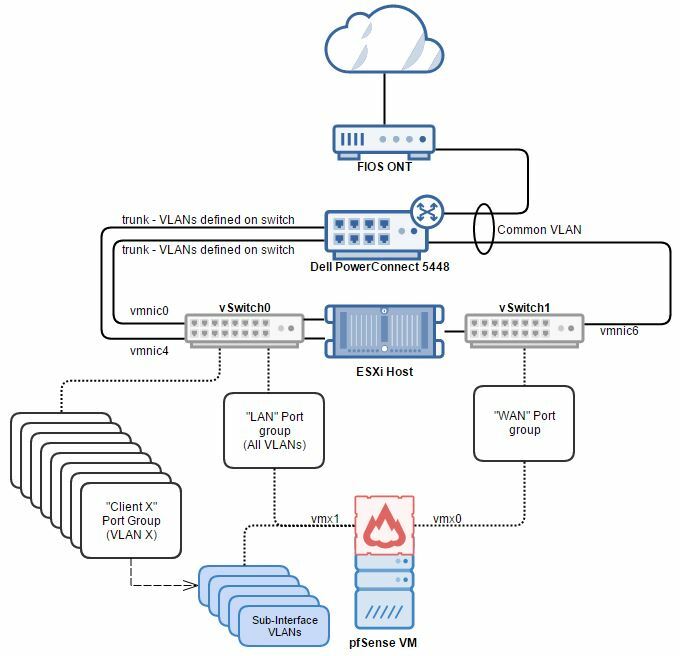 Using the information in your blog, I am trying to configure a pFS to act as an router/firewall for my single server home vsphere lab. I want to simulate a multi-datacenter network representing 2 physical sites. 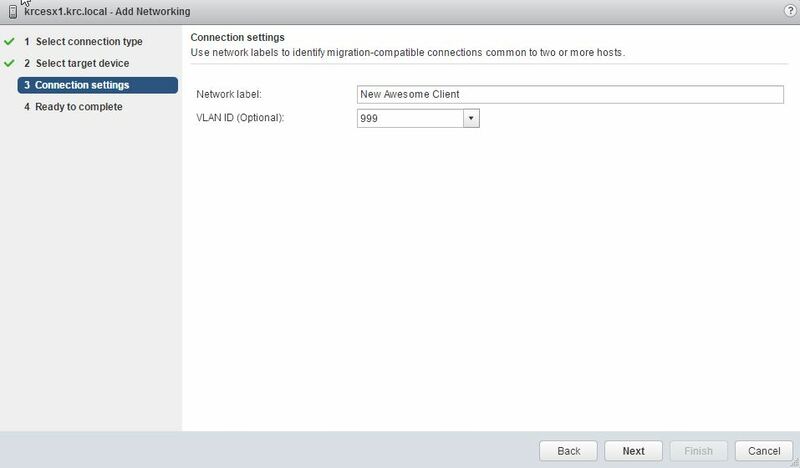 Is something like this even possible on a single host or I would need to have a second host, whereby each host has its own pFS appliance and I simply connect the two WAN ports of the routers together with the same IP address range. Could do with your input. Thanks! Yes, still using pfSense. It’s been through many upgrades but this site is still served behind one! I am a huge PF fan however I am in the process of moving my lab network over to a Edge Router Lite. Still having seconds thoughts since PF just works. I’ve researched the ERL when making recommendations to friends and colleagues. The problem I have with it is that it’s really just a router. It can do some but not all of what pfSense does. Because I run my pfSense as a VM on VMware hosts with 10 Gbps interfaces, I get very fast routing/firewalling that I can’t afford to recreate on hardware. We have a similar setup and we tried following along with your example. However, we’ve ran into problems whereby the protected machine and pfSense cannot see each other. We’ve posted a detailed description on Stack Overflow (Networking) where if you can you could give feedback on what we could have missed. Thanks. Excellent write-up. I’m considering a similar setup but perhaps eliminating vSwitch1 and moving vmnic06 to vSwitch0, essentially creating a 3-port trunk. I would then define a new VLAN for WAN traffic, say WLAN VLAN ID:300, and add a corresponding port group to vSwitch0 in ESXi. The pfSense VM would next be added to this port group to receive WAN traffic on vmx0 (i.e., with ESXi untagging WAN traffic as it enters the VM through this interface and tagging traffic as it leaves). The LAN (VLAN ID:All) port group would also be connected to the pfSense VM as vmx1 and then sub-interfaced in pfSense just as you have done. I suppose this is really just a trade-off between physically separating WAN traffic on a dedicated NIC (i.e., more security but with potentially a single physical point of failure) versus combining WAN traffic on the trunk (i.e., theoretically less security but with better physical redundancy by pooling the NICs). Hey Don – the only problem with a 3-port uplinked vSwitch is that it is expected that any portgroup (and thus VLAN) defined on the vSwitch is available to all uplinks unless you override the teaming/failover policy for the portgroup. That said, there’s nothing keeping you from putting VLAN 300 on the uplinks as part of a trunk, and landing your WAN on an access port on the physical switch in that same VLAN. Not sure if you get that, but basically, you don’t have to have a dedicated NIC for uplink to WAN, you can just trunk it as you mentioned. Personally, it’s all 802.1q and secure – there haven’t been instance of VLAN hopping outside of very specific situations so I think you’d be fine either way. Personally, I prefer to not mess with the teaming/failover overrides if possible! Good thinking! Bugatti, any luck … i’m also on the same track to achieve it! So the problem you’re having is that your switch needs to support this! The way it works is that your switch is still used even though pfSense is a VM with virtual interfaces. If you set your switch ports to trunk, all all vlans, native vlan 1, this will work. Also remember, you can’t double tag. So when you’re creating a port group setup for VLAN 10 then everything in that port groups is being tagged for VLAN 10. So don’t tag within the Windows guest. If everything is VLAN 10 then the switch port can be tagged for VLAN 10 and everything else untagged. A diagram would be helpful – feel free to post a link. Sorry it took me a while to reply. Your best bet to keep things flexible is to trunk. I’m thinking about a similar setup but with the particularity that each VLAN will host the exact same VMs and IP settings. 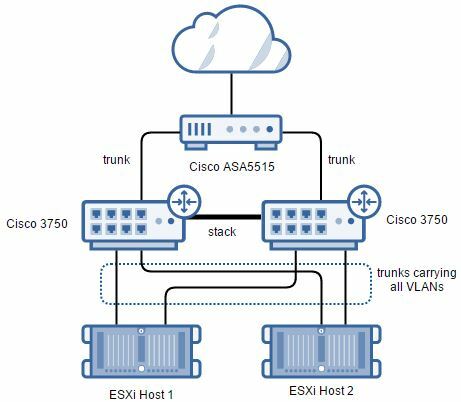 I haven’t tried yet but do you foresee some issues in having that sort of setup where the IP settings are always the same but we isolate the traffic in using VLANs? Great read! I’m doing a similar setup!